You can select repeat, random, and scan modes when playing a track or files. 3. Rotate t o select a mode, then press . 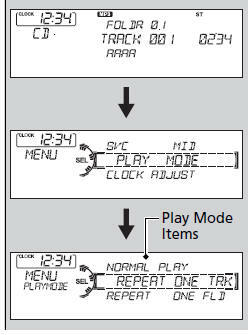 Press the RETURN button to go back to the previous display, and press the MENU button to cancel this setting mode. REPEAT ONE TRACK: Repeats the current track/ file(s). REPEAT ONE FLD (MP3/WMA): Repeats all files in the current folder. RANDOM IN FLD (MP3/WMA): Plays all files in the current folder in random order. SCAN TRK: Samples all tracks on the CD. (MP3/WMA): Samples all files in the current folder. SCAN FLD (MP3/WMA): Samples the first file in each folder.